The head of the European Commission, Jean-Claude Juncker, seems to have invented a new way to address a European leader, using the word "dictator” to the Hungarian prime minister during arrivals at the Friday EU summit in Riga. "The dictator is coming!" Juncker is heard was overheard saying as Viktor Orban approached him. He then repeated the word to Orban's face, following it with a warm handshake and a slap on the cheek. Orban's reaction was a smile and a bit of friendly shoving. The right-wing populist Orban has been often criticized for his "strongman-like" outlook. In power since 2010, he has introduced a number of reforms that Western officials deem contrary to human rights. His latest initiative is the possible restoration of the death penalty, which was banned in Hungary in 1990. In late April, Juncker vowed to "battle" Orban's possible intent to restore the death penalty, saying it goes against EU rules. On Tuesday, the European Parliament called a meeting on the issue, to which Orban flew in to give his response. He insisted Hungarians had the right to debate the revival of the death penalty. "Hungarians talk straight about tough things. We don't like to beat about the bush. We are a frank people," he said. He also used the occasion to slam Juncker's new plan for helping asylum seekers in Europe, calling it "insanity." Juncker's supposedly joking Friday remark echoes a December 2014 rant by US Senator John McCain, who went so far as to brand Orban a "neo-fascist dictator" in a Senate address. That remark triggered fury in Budapest, where the US ambassador was summoned for an explanation. Orban himself said McCain's "extreme manifestations" brought Hungary's national independence "under attack." The US State Department, however, was quick to distance itself from McCain's words. 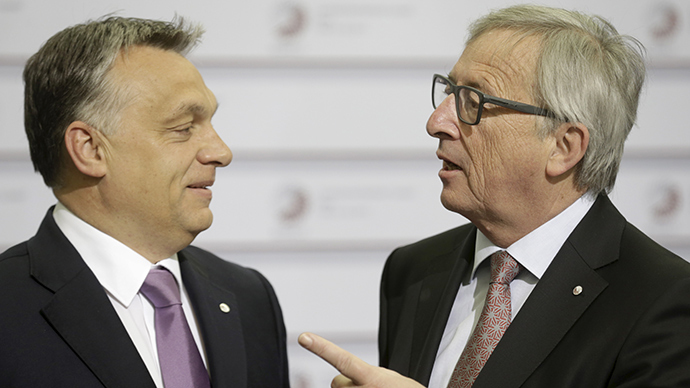 The "dictator" line is apparently a running jibe between Juncker and Orban, Reuters reports. It cites unspecified EU officials and diplomats as saying they had heard Juncker use it to Orban in the past – only this time, it was caught on camera. At home, Orban is seeing repeated protests demanding his resignation. Some of the largest, numbering about 3,000 demonstrators, came in February. The leaders then claimed "the majority of the people" in Hungary were against Orban's improving relations with Russia. The protesters represented about 0.17 percent of Hungarian capital’s 1.75 million population. Orban's supporters credit him with leading the country out of crisis, lowering personal income tax, cutting utility bills and standing firm against Brussels' influence. In the April 2014 election, Orban's Fidesz party got a two-thirds majority.